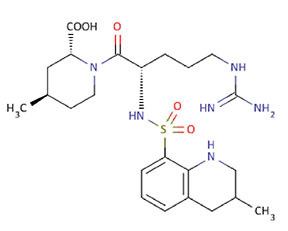 Argatroban is a synthetic peptidomimetic thrombin inhibitor which is in clinical use. It presents significant advantages as an anticoagulant in deep vein thrombosis, stroke prevention in atrial fibrillation and thromboembolic disease and especially in patients with coronary artery disease and heparin-induced thrombocytopenia. Identity: Determined by NMR and LCMS.